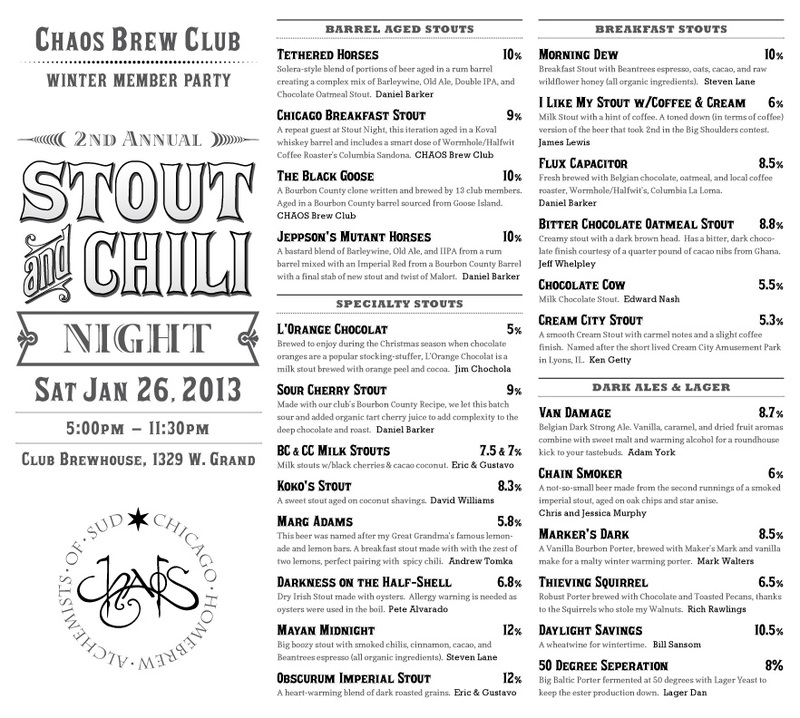 In the darkest depths of winter CHAOS Brew Club members come together to warm our souls with home brewed stouts and porters paired with gourmet chilis. This year we get to drink the stout we brewed and barreled last year, along with over 20 other shades of black on tap. Members Only - you have to join the club to get in on the party. Mon Jan 28 - Fri Feb 1: CHAOS Wing Marathon, like chicken and beer? Not a member? We have many levels; non-brewers can become a Friend of CHAOS, or you can try out our club brew house with a Trial Membership. CHAOS Membership Info. What's the best way to post a link to stout night on my fb wall? I'll be there around 5pm. Do you still need volunteers? if you're still looking for music / DJ and have a sound system I have music options, though I'm not sure how early I'll be able to make it there. Great! My cousin who goes to cosmetology schools said he enjoyed the time. Thank you so much for sharing great creative resources to follow I really appreciate it. Social media does have a role in marketing, but that role depends on your business and how it best fits the needs of your business. It also depends on the effort you are willing to put forward when it comes to social media. Learn the role social media can play in marketing and how it can benefit you as a company. Interesting. As I have heard, thousands of people are trying to join the chaos free membership. I am pretty sure that this is really a big advantage for us and I hope that there will be an available slot for myself because I am very much interested to join. This is great blog i like your website and its design they are both awesome. That was a very great information. Thanks for posting. Please keep on posting more updates about that. your post is full of information. Web Design Manchester web design for less. I found so many entertaining stuff in your your blog. I am glad to find your distinguished way of writing the post.